Turnover Calculator Find out how much losing an employee REALLY costs your company. You might be shocked at just how expensive turnover can be! 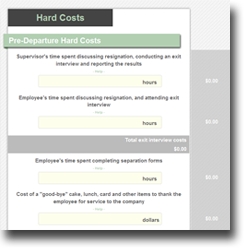 The Ultimate Turnover Calculator will calculate turnover costs and educate supervisors on the costs associated with replacing an employee. "I've always had a hard time convincing my supervisors that our turnover was an issue. With the Ultimate Turnover Calculator, I let them enter the answers and soon the reality of the costs came to light. The costs were much more than they could have ever imagined and they could not argue with the data since they were the ones who entered it. My supervisors are now working with me to reduce the turnover and thus reduce the costs."